Skytran: Tel Aviv builds the levitating public transit of the future. All images courtesy of Skytran. Tel Aviv is set to become the world’s first city with the magnetically levitating skytran system of mass transit, described by its developers as ‘the jetsons made into real life’. designed to reduce urban traffic congestion, Skytran would provide a greener, less expensive, faster, and more comfortable alternative to cars and bus lines through the use of personal two-seater pods in a point-to-point service which travelers can use to reach specific destinations. a vehicle is requested via website or mobile app and arrives almost instantly. The traveler boards, having already entered the desired stop, and the pod glides there directly. In this way, skytran also provides a possible solution to the last mile problem encountered in most public transit networks. The system was co-developed by engineers from NASA and the private company skytran, based at NASA’s ames research center in california, where a full-scale working skytran is currently under construction. Tel Aviv, the first city to begin implementing the maglev system, has just appointed US consultancy jenkins gales & martinez to oversee the introduction of the revolutionary technology. 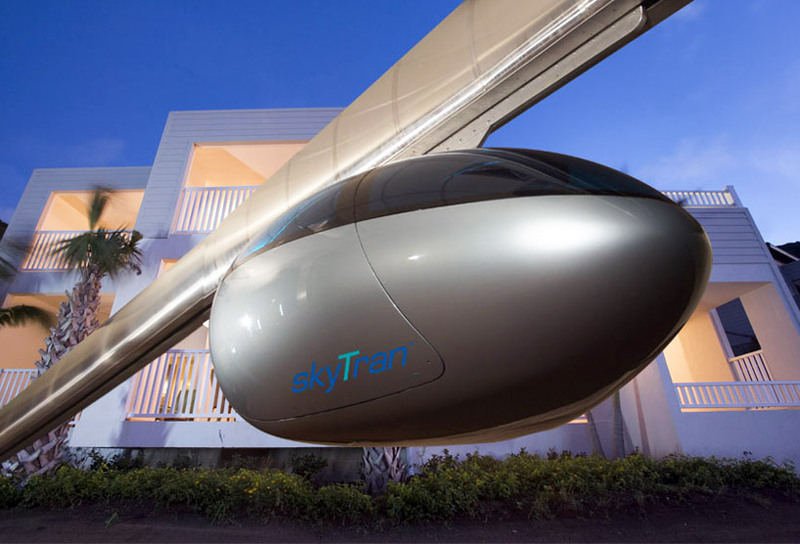 Whereas creating or expanding underground metro systems is disruptive and expensive, the Skytran pods move on a guideway suspended 20 feet above ground, making use of untouched vertical real estate. modular construction methods means that the actual installation of a skytran system greatly reduces both cost and time compared to the construction of other kinds of public transport. stations for the systems, comprising simply a staircase and platform, are spaced so that the average distance from a hub to any point in the covered area will be within about one quarter mile, although larger hubs could provide service in major existing metropolitan centers. when boarding and discharging passengers, pods utilize a side ‘acceleration line’ track so as not to block up traffic. The pods are built of composite materials to be lightweight and thus easily supportable. like a tram, the vehicles are powered via electric current running from above; Jerry Sanders, CEO of Skytran, says that these guideways will eventually be outfitted with solar panels, making skytran a nearly energy net neutral system of public transit. Magnetic levitation, enabled by the presence of a magnet in each pod and an induction coil within the skyway, minimizes the effects of friction for a quiet and smooth ride, and while the cars can run at speeds up to 150mph (241km/hr), their actual speed will be considerably less than that in urban environments and as travelers become accustomed to the system. Jim Brasher of the television show masters of innovation visits the skytran to talk with Jerry Sanders. Skytran’s CEO Jerry Sanders estimates that while the cost of a Skytran trip would be slightly more expensive than a bus because of its more private enclosure, it would remain less than a comparable trip in a taxi, in addition to being faster. Alongside Tel Aviv, other cities in Israel, as well as in India, Indonesia, Malaysia, and the USA have all expressed interest in installing Skytran networks.